Peterborough dropped points for the first time in League One this season as they were held to a 1-1 draw by Doncaster. John Marquis gave Rovers the lead five minutes before half-time but Ryan Tafazolli struck in the 58th minute to maintain Posh's unbeaten run. Steve Evans' side remain top of the table but only on goal difference after Pompey’s win over Plymouth. Sunderland dropped to fourth despite salvaging a point with 10 men against lowly Oxford. Ricky Holmes fired the visitors ahead after 16 minutes at the Stadium of Light and when Max Power was sent off three minutes later the Black Cats appeared to be heading for a first league defeat of the season. However, substitute Charlie Wyke scored with Sunderland's only shot on target seven minutes after half-time to deny the U's. Barnsley and Walsall also remain unbeaten. A Kieffer Moore first-half brace helped the Tykes beat Gillingham 2-1, while Walsall were held to a goalless draw by Blackpool. Shrewsbury are still searching for their first win of the season after drawing 1-1 with Bristol Rovers. Stefan Payne gave Rovers a 53rd-minute lead from the penalty spot but they had Joe Martin sent off for a second yellow card six minutes later. A Daniel Leadbitter own goal 17 minutes from time earned Shrewsbury a point. Goals from Stephen Quinn, David Templeton and Liam Boyce saw Burton claim a 3-0 victory over AFC Wimbledon. Seamus Conneely cancelled out Matty Lund's late goal as Accrington and Scunthorpe drew 1-1, while Joe Jacobson and Matty Pearson were on target for Wycombe and Luton respectively as they played out the same scoreline. 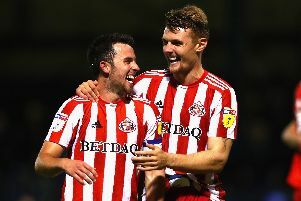 Joey Barton picked up his first home win as Fleetwood manager as goals from Ched Evans and Ashley Hunter secured a 2-1 victory against Bradford, despite the Cod Army having Wes Burns sent off in the first half. Charlton won 2-1 at Southend in a contest which saw three players sent off in stoppage time. Lyle Taylor put Charlton ahead after 57 minutes but Theo Robinson equalised within three minutes. Krystian Bielik headed the winner three minutes from time but the game descended into chaos late on as Charlton's Tariqe Fosu, Southend goalkeeper Mark Oxley and Shrimpers winger Michael Kightly were sent off after a scuffle in the corner. Elsewhere, Rochdale beat Coventry 1-0 at the Ricoh Arena thanks to Calvin Andrew's second-half goal.